The App is available for Iphone only. Football Superstar brings a new twist to the market with a deep, involving and addictive game that feels fresh and new. 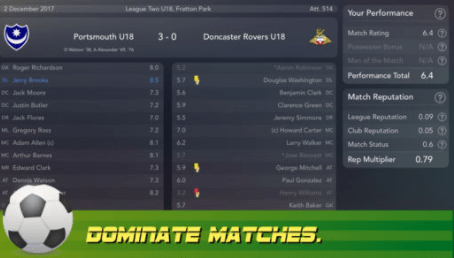 In a market flooded with “football manager” type clones, Football Superstar puts you in control of the career of a 14 year old footballer, developing skills and abilities, winning contracts and going as far as you can. The whole idea of controlling one player and developing a character, using your brain rather than reflexes, is exciting and innovative. The game runs smoothly and within days you will be hooked, waking up at all hours to check on the progress of your player. A must for football fans! The base game is free and it certainly is worth your time investment, but even the fairly priced add on such as the $1.99 game unlock and the extra cash on offer are all tempting. The game is so well put together and incredibly well developed that it deserves not only your time but your investment. I usually heavily regret buying in app purchases almost as soon as I have made them, but that is far from the case here. The app is so deep and involving and you will spend so much time using it that you won’t at all mind parting with a little cash to enhance your game. As with all games from Lazyboy, a good amount of effort has been placed into the visuals and how the game looks. On screen, both phone and tablet, this looks clear with everything well-spaced out and nice lively colours. No complaints at all! From the minute you install Football Superstar onto your phone you will be hooked by the ease of the way it plays. No complicated instructions or tutorials, the whole way the game runs just feels very natural and easy. The menus are clear, there aren’t tons of “hidden” menus which hampers these games sometimes and everything is clear. I never once felt lost or wondered what to do….I found the whole gameplay a joy and the ease of use to be a pleasant surprise. The game will have you hooked from the off and you will certainly want to play through the full career of your 14 year old star. The more you go the deeper the game gets, the more issues there are to deal with and the more decisions need to be made. Your first run through will just give you a hunger to try again and develop your player in different ways. Very basic interaction but then again it is not really needed in this sort of title. It all runs from your effort and skill and you will be so addicted you won’t miss these features at all. Football Superstar feels original and feels fresh. Unlike many other management maps, this does not feel like anything I have ever played before and instead feels like a novel breakthrough in management games. Many imitators are likely to follow, but they would be hard pressed to match the quality, the depth and the ease of use involved with this title. It is a credit to all involved and clearly the fruits of a lot of worthwhile labour! A unique, deep and addictive management title that requires attention to detail, planning and thought….all with plenty of reward! One of the best apps I have played in a long long time! What Makes a Good Football App?